Iyengar Yoga - A form of Hatha Yoga that has an emphasis on detail, precision and alignment in the performance of posture (asana) and breath control (pranayama). The development of strength, mobility and stability is gained through the asanas. Power Sculpt - A combination of energizing strength movements mixed with tone sculpting exercises! Power Training - A perfect combination of fat blasting & all-over body toning to help reach your fitness goals. This is a great fun class for all fitness levels, ending with abs and a relaxing stretch. Yoga Power - A complete yoga practice where you will move from easy poses to more challenging ones in a gentle and respectful way while emphasizing strength and flexibility. Silver&Fit® Experience - S&F Experience is for moderately active older adults who exercise in some way one to two days per week. The class is designed to increase the participant's flexibility, joint stability, dynamic balance, coordination, agility, reaction-time, muscular strength, and cardiovascular endurance. (45 min) **Chairs are optional**note: with warm up and cool down the class could be 60min. SilverSneakers® Fitness - Have fun and move to the music through a variety of exercises designed to increase muscular strength, range of movement and activities for daily living. Hand-held weights, elastic tubing with handles and a SilverSneakers® ball are offered for resistance. A chair is available if needed for seated or standing support. **Chairs are optional**note: with warm up and cool down the class could be 60min. SilverSneakers® CardioFit - An advanced group exercise class designed for active adults who desire a safe and effective low-impact cardiovascular workout. Energizing and easy-to-follow movements promote hearthealthy, total-body conditioning to increase cardiovascular and muscular endurance. In addition, a variety of strength training options are offered to provide a well-rounded workout. Spinning - The Spinning® program is the global leader in indoor cycling training. Uniquely tailored to suit a wide range of abilities and fitness goals, the Spinning program and patented Spinner® bikes manufactured by Star Trac® deliver a personalized workout, incredible calorie burn and personal challenge—all at a selfdirected pace. A typical Spinning class can have you burning over 600 calories! Yoga - A unique workout consisting of proper breathing exercises and postures that lengthen and strengthen your muscles. 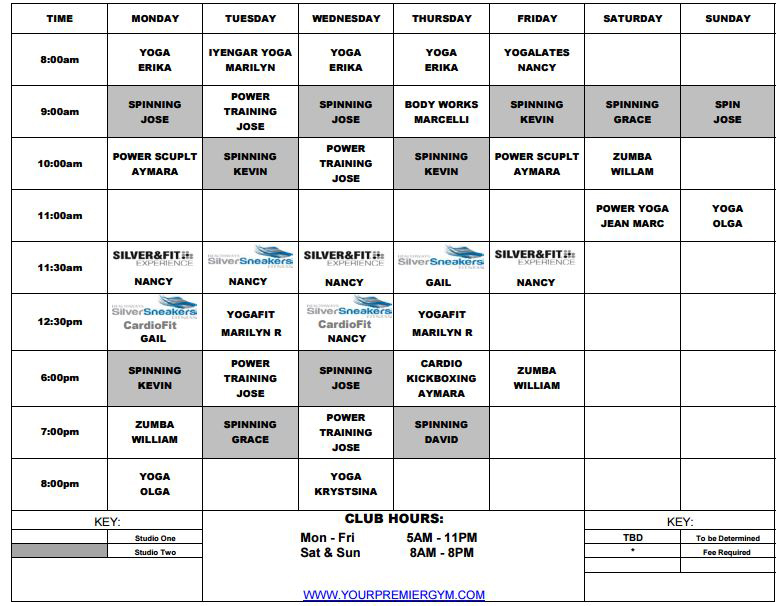 All fitness levels will benefit from this rejuvenating class! YogaFit - A class designed for older adults to challenge you physically and mentally with simple/safe yoga exercises using a chair for support to increase flexibility. Yogalates - A combination of Pilates & Yoga to stretch and strengthen your body. The emphasis is on core control in all poses and focus on breathing while in motion. The full body is covered, leaving you feeling toned and flexible. Zumba - Are you ready to party yourself into shape? That's exactly what this Zumba® class is all about. It's an exhilarating, effective, easy-to-follow, Latin-inspired, calorie-burning dance fitness-party™ that's moving millions of people toward joy and health.